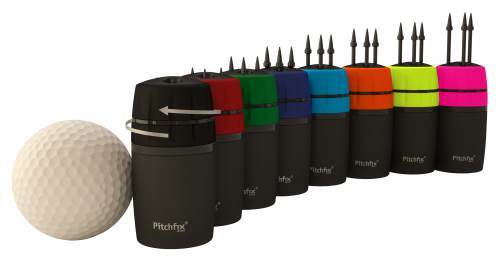 New York (April 7, 2015) – Pitchfix USA, a global market leader in switchblade divot tools and other golf related products, today announced the U.S. launch of its latest product release – the Pitchfix Twister. An innovative divot repair tool, the Twister makes ball mark repairs easy for golfers and helps reduce pitch mark repair damage to greens. According to Pitchfix, when ball marks are repaired with traditional pitch forks very often the root structure is torn which creates an air pocket under the mark and a compacted piece of soil at the surface, making it difficult for the grass to regenerate and heal. Pitchfix Twister’s patented technology allows Twister to work differently, says the company: the golfer simply pushes it in and out of the affected area, restoring the ground and relieving compaction simultaneously. This quick and simple procedure, according to Pitchfix, results in better repairs that recover quickly, making it virtually impossible to do damage with the tool. According to Fokke, the Twister will play a critical role in improving the condition of greens and reducing ongoing maintenance costs to repair damage. Pitchfix currently offers an array of diverse and innovative products for golfers worldwide:Twister Divot Tool; Classic Divot Tool; Hybrid Divot Tool; XL 2.0 Divot Tool; Alignmee Marker Alignment Tool and Hatclip Ball Marker. Pitchfix currently has operational and manufacturing facilities in China, the Netherlands and the U.S. In the U.S. the company recently opened three fulfillment centers with five customer facing/support employees to facilitate custom order processing and fulfillment. Custom orders are fulfilled within two to eight days of receipt. For further information go to www.pitchfixusa.com .